Have you, or a family member, valiantly fought for our nation’s freedom? We are dedicated to veterans and salute you for your service. Would you like the opportunity to list your home for free? Do you want to save money in the process? Would you like to find your next home? Let a Because You Served-approved realtor guide you through the process. All veterans and their family members can do that and more through Because You Served. Get your free Because You Served Military Benefit ID today. Simply fill out the form below and let us know you, or a family member, are a veteran. Once your application is processed, you’ll receive an email with your Because You Served Military Benefit ID credentials. Your Benefit ID never expires. You have everything to gain—so sign up today! Do you currently serve or did you serve in the military? This includes Army, Marine Corps, Navy, Air Force, and Coast Guard regular Active Duty and reservists, and Army and Air National Guard personnel. Do you have an immediate family member who has served in the military? Congratulations! 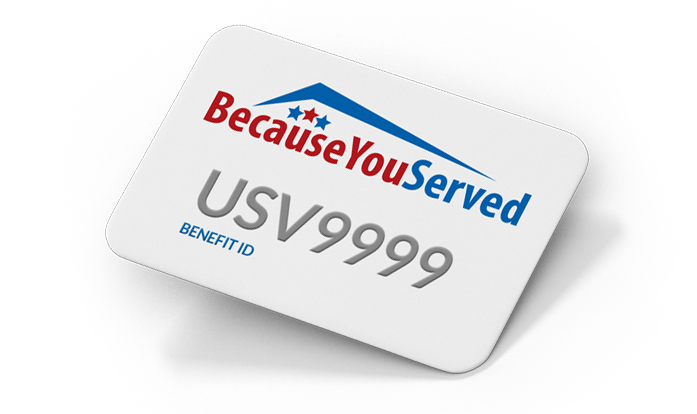 You are eligible for a Because You Served Military Benefit ID. Apply now. Unfortunately, you aren’t eligible for a Because You Served Military Benefit ID. If you think this is in error, please contact us at 855-473-7833.